Start where SheSpoke* left off. The SheSpoke Southside Hub runs from 10am to 2pm and welcomes you to relax and unwind in, with a free champagne breakfast throughout. Everyone is welcome. Four come n try community group host rides that are finishing at this hub in time for this speaking event, arriving at 11am. St Kilda Cycling Club’s Women’s Social Ride. Ride and event organisers are welcome to start, end and join in their planned activities at this hub. Just get in touch with Jess so we can cater for numbers. This is a free event by the City of Port Phillip and is staged at the SheSpoke Southside Hub at The Great Provider. Held in a venue that makes use of our magnificent beachside views and bike trails. The City of Port Phillip is proud to support The Women’s Ride and its collaborative partners. 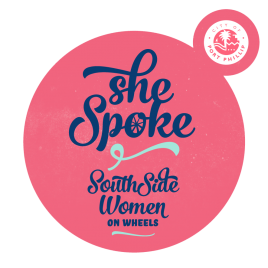 * SheSpoke 2014 was a three month festival produced by the City of Port Phillip dedicated to promoting women’s participation in bike riding. The series of rides, workshops and special events were designed to celebrate, inspire, entertain and empower women of all life stages. She Spoke is about having fun, making connections with other women, learning new skills and trying something you may not have tried before (or for a long time).